NEW ALBANY, Ind. – Be sure to purchase your tickets for the 2014 Champions Dinner. A limited number of individual tickets remain for the event which will be held on Saturday, Aug. 16 at Huber’s Orchard and Winery in Starlight, Ind. Join new IU Southeast Chancellor Dr. Ray Wallace, IU Southeast coaches, athletic alumni, and community leaders as we celebrate another great season for the IU Southeast athletic department. 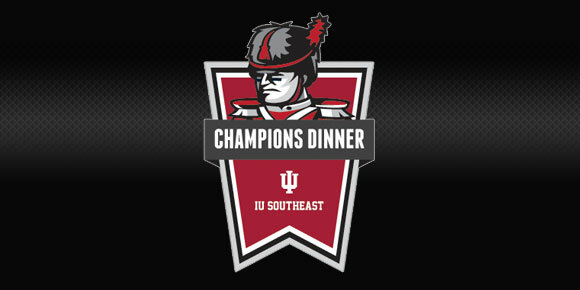 The Champions Dinner is a celebration of IU Southeast Athletics, the positive impact it has on our community, and the people who help make it happen. Jim Morris, the former IU Southeast men’s basketball coach and first athletic director, will join us to present the Jim Morris Champion of Character Award for the second-straight year. The Jim Morris Champion of Character Award is given to a student-athlete who exemplifies strong moral character, sportsmanship and the core values of the NAIA’s Champion of Character Program. The Champions Dinner will be held Saturday, Aug. 16, 2014 at Huber’s Orchard and Winery’s Plantation Hall. A limited number of tickets will be available to the public. Individual tickets cost $50 and will be available for sale in the IU Southeast Athletic Office located inside the Activities Building at 4201 Grant Line Road, New Albany, IN 47150. For questions about ticket sales, please call (812) 941-2432 or send an e-mail to athletics@ius.edu. Sponsorships for the event are still available, click here for more information. 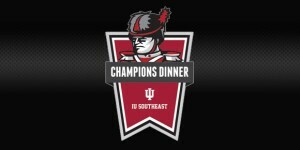 Proceeds from the Champions Dinner will support IU Southeast athletic scholarships.